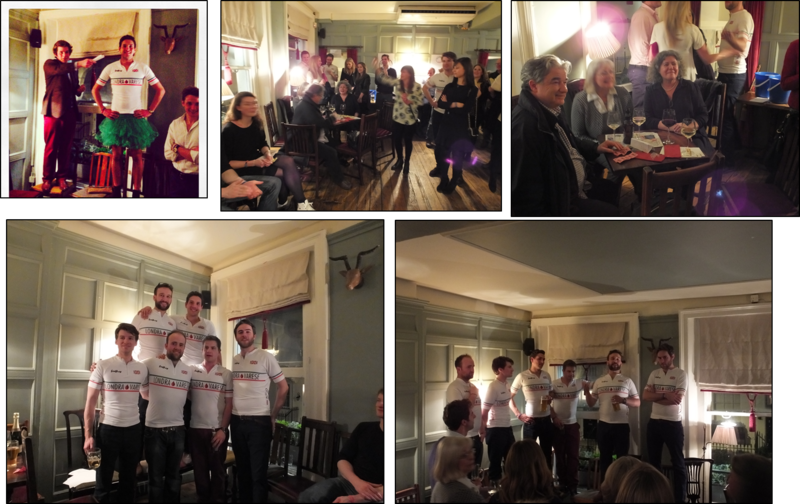 Saturday 22nd March took the team to the fantastic Antelope pub in Sloane Square, where we hosted a brilliantly supported fundraising event. We must send our sincere thanks to the Antelope pub for hosting us so warmly and for all of our family, friends and guests for coming an supporting us so generously. We held a raffle with fantastic prizes, many of which were kindly donated. Items such as hampers, bottles of fine wine, whiskey and even a cheeky jellycat cuddly toy all went during the evening – well done to all those who won something! We also held a silent auction which saw items such as a holiday home in Dartmoor, signed rugby memorabilia and even a signed James Bond SkyFall cap all go for generous bids. As a surprise addition to the night we also held a live auction, brilliantly administered by William Mathias, who expertly saw off 3 lots. The first to go was the promise of the whole team wearing t-shirts with your face on it for an entire day of riding en route to Italy – this went for a handsome sum indeed. We also saw the promise of the team riding in animal onesies for an entire day go for a hotly contested amount – with the winner eventually paying for us NOT to wear onesies for an enitre day at risk of heat stroke! Last but not least saw JP in a tutu and for a princely sum he will now wear said tutu en route to Italy! THANK YOU to everyone who donated prizes, attended, suported, encouraged and wished us well – we are truly touched by your kindness.